Since the stock market crash of 1929 and the severe economic depression that followed for most of the 1930s, fashion had been an escape. Looking to the movies, women and men, escaped their difficult daily lives and imagined a care free and very glamorous life in Hollywood. Fashion followed movie stars apparel both on and off the set. Bias cut dresses were modest but feminine. Men’s wide shouldered suits mimicked the masculine physique underneath. Rich furs, white paste jewelry, coordinated accessories looked like a million bucks. Fashion did not reflect real life in the 1930s. The tables turned in the 1940s. WW2 begin in 1939 and fashion took on a new role. Men’s fashion stopped progressing until after the war- a reflection that most men were serving in uniforms instead of enjoying life at home. Women’s fashion echoed men’s traditional clothing with man-tailored dresses, coats and hats. These new serious looks were not about an idealized life but about supporting the war effort through fashion. A woman’s duty was to take care of the homefront both her household and in jobs previously held by men. He clothing reflected this practical and conservative time where materials were limited, even after the war ended in 1945. It took until the end of the decade for woman to adopt Dior’s New Look that returned women to an ultra feminine silhouette and for men to adopt a relaxed fit in their clothing. The 1940s were defined by a clean and slim silhouette with a somewhat military feel. Jackets, blouses, sweaters and skirts were short and close-fitting, all unadorned and with the requisite sharp shoulder pads. Long sleeves were out, dresses were casual, and pants and ‘playsuits’ became everyday attire. Before World War II, Paris was the epicenter of fashion. All of the new styles originated there. Anonymous American designers simply copied the looks coming from France for their wealthy clientele or for stores. The 1930’s will be remembered for their glamour, despite the Depression. Hollywood starlets were clothed in long, draped and flowing gowns made of satin, crepe, silk and velvet. Dresses and gowns began to be bias cut, meaning the fabric was cut diagonally, allowing it to cling to curves. Coco Chanel brought the day suit into fashion, with a fitted jacket and a long skirt. Fur was the most wanted luxury item. But after Germany took over Paris in 1940, many of the designers closed their fashion houses, some fleeing the country. Those that did stay didn’t see their styles leave the country. The rest of the world was left to come up with their own styles. New York took over, creating a look that was dominated by the war going on across the ocean. A lot of the materials normally used for clothing became scarce during the war. Wool was used to make uniforms and coats for the soldiers. Leather was needed for their boots. Silk, normally used to make dresses, undergarments and stockings, was turned into parachutes and waterproof maps. Metal and various chemicals were needed to make just about everything for the war effort. 1942, a woman donates her silk stockings to be made into parachutes. She wears socks instead. Civilian clothing had to resort to using new materials. Nylon, created by DuPont and introduced in 1938, replaced silk for women’s items until it began to be used for the same purposes as silk for the war. American cotton began to take over as a casual fabric of choice. Wool blends were introduced to save wool for military uses, and the synthetic fabric rayon became the most widely used fabric of the time. A softer, silkier version was used for day dresses, and a thick version replaced wool for suits and coats. ‘Vinylite’ could be used instead of leather, and other forms of plastic were used for all kinds of applications. Aside from breakthroughs in man-made materials, fashions of the day were most affected by the governmental clothing restrictions put in place for the duration of the war. The very silhouette that dominated the ’40’s was a casualty of war. In Britain and elsewhere in Europe, ration coupons for clothing were given out on top of the restrictions, and they didn’t go far. The United States avoided the coupons by putting strict rules in place for manufacturers. The only clothing item that was rationed were leather shoes starting in 1943, and they were only available in black, white, navy and brown. The United States Production Board put into place ‘Limitation Orders,’ order L-85 governing women’s clothes, which were in effect until 1946. These restrictions were much less severe than in Europe, but still greatly limited what clothing was to look like. The length and width of blouses, skirts and dresses was restricted, as was sleeve length and hip width. The amount of pockets, buttons, pleats and seams was dictated, and most decorations were not allowed. This came to be known as the ‘no fabric on fabric’ rule. The colors of fabrics were set each season to conserve chemicals, so only a handful of patriotically named hues were available. The heels on shoes could only be 1 ½ inches high. All of this interference resulted in a slim, uncluttered look. Skirts were shorter and tighter than anyone was used to, and shirts and jackets were plain and practical. As the prices of clothes soared due to the shortages, they had to last longer and go further. Pieces were extremely well-tailored and the styles started to work for a multitude of occasions. Although evening-wear was still made and worn, people began to dress more casually in restaurants and theaters. Versatile separates and sportswear took over, and women began to wear pants as a safety precaution in the factories they were working in. Home sewing became popular. In Europe fabric could be had for fewer coupons than a ready-made garment. In the United States, pattern sales skyrocketed. Citizens were encouraged to mend old clothes, recycle old fabrics into new garments and combine dresses to make new ones. Pamphlets with titles like ‘Make and Mend,’ and ‘Make It Do Until Victory’ showed women how to fix and care for their clothes to make them last, and to make them from other household items like blankets and curtains. Here is a book on Make-overs from Coats and Suits. The plain and functional styles lasted throughout the war. When U.S. restrictions were lifted in 1945 and ’46, women continued to wear their war-time garb. Colors did return to wardrobes, softer and brighter, and skirts got a little bit longer and flouncy. In 1947, Paris designer Christian Dior showed his debut collection, soon to be dubbed the ‘New Look,’ which was the total opposite of the severe styles of the war. The silhouette was soft, an extreme hourglass figure achieved with a corset and bust and hip padding, and the skirts were enormous confections of fabric. The New Look didn’t take off in the United States. Women felt that Parisian designers had acted as though no war had taken place, while they sacrificed their wardrobes for the war effort. However, most were also ready for a change. As soldiers came back, women stopped working and returned to new homes and cars in the suburbs. The economy prospered, and clothing manufacture became cheaper and easier thanks to new methods devised for the war. New York and California remained in the fashion game, and American designers started to be known by name. Eventually women adopted the New Look that would become the style of the ’50s. 1930s men’s clothing, either for day, sport, or evening were styled to make a man feel “larger than life.” During the 1941-1945 WWII fabric rations limited cloth to make suits but not style. The Zoot Suit with its bright colors, baggy legs and long jackets was a complete deviation from the norm. However, that trend was only popular with the young, urban men during the war years. Most men chose basic men’s suits that haven’t changed dramatically since the beginning of the century. There were, however, a few features that made a suit style unique to the 1940s. The war board placed restrictions on men’s clothing just as they did for women. The restrictions were not as dramatic as they were for women. Suit pockets could not have flaps, trousers could not be more the 19 inches around or be cuffed, and suits were sold without vests (waistcoats.) The cuffed look was so popular that men quickly figured out you could purchase longer length pants and cuff them at home. The double breasted suits were forbidden during the war except for formal occasions such as weddings. Most men’s kept their clothing from the 1930s and wore them through the early ’40s war years. Tailors became skilled at repairing or repurposing double breasted suit jackets from the 1930s into single breasted jackets or sport coats. It was a sign of support for the war to be seen in your pre-war suits. In Britain the clothing restrictions were harsher. Jackets could not have pleated backs, metal zippers or buttons, feature raglan sleeves or have half belts. Zippers in flys, called front fly fasteners, were allowed although button flys were preferred and easier to obtain materials. War time clothing influenced men’s fashion design after the war by coping or modifying uniforms into civilian clothes. Trench coats, bomber jackets, knit undershirts, pea coats, chino pants and aviator glasses all have roots in WW2 military clothing. With so much military surplus available after the war civilians would buy and wear military clothing for several more years. The improvement in machinery, textiles and manufacturing of military clothing made post war ready to wear civilian clothing a booming industry. The quality and eventually affordability of ready made clothing gradually put local tailors and seamstresses out of business. The biggest influence war time restrictions had on men was the further introduction of casualness. After the war the need for suits to be worn at all times were replaced by more causal sporting attire. Collarless knit tee shirts, open collar dress shirts, ascot ties, slip on loafers and sandals in summer became the everyday man’s dress code. Men were tired of scratchy uniforms and confining suits. The freedom casual clothes brought to men were a big sigh of relief. Ironically the very clothing that caused such turmoil during the war years, the zoot suit, was the single piece of fashion that influenced men’s post war clothing. 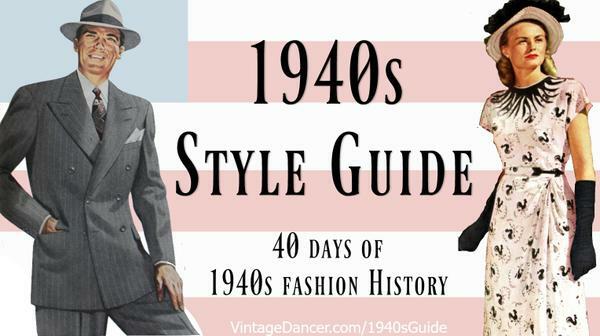 Longer, looser jackets, double pleated pants, big hats, and even wide ties made their way into late ’40s men’s fashions. Men were eager to put the war behind them and embrace the clothing they were previously forbidden to wear.